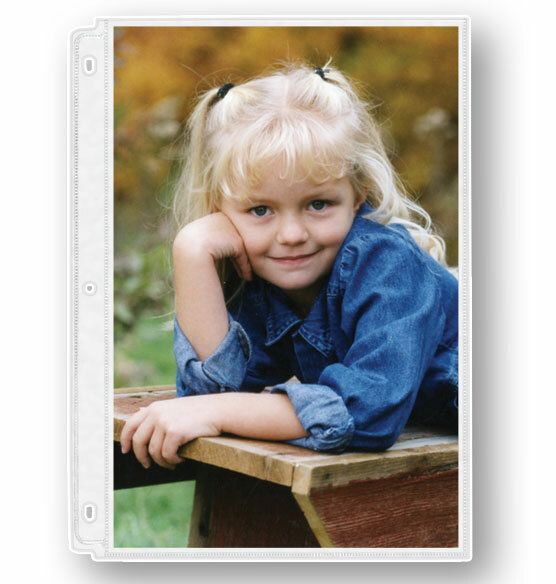 Exposures double weight 8 x 10 photo pocket pages are made of photo safe material which makes them the safest archival page protectors available to protect your most precious photos. 9 1/8" x 10 3/8"
These appear to be the 8.5" X 11" photo pocket pages with seams inserted to fit an 8X10 photo. 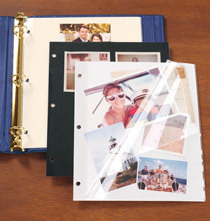 For those of us who have used these for years, this design is larger than the old 8X10 pocket pages and makes the album pages no longer uniform. Great quality, just really wish you still offered the pages that were actually 8X10 - not 8.5X11. There is a side and bottom seam that I don't have any idea what the use is for, other then sticking to far out of my 8x10 Felicity album. The product is not as heavy weight as it once was. Please bring back the Single Weight Pocket Pages 8x10 (item 309339). I have used them for years with the Presidential Leather Albums. These new 8x10 pocket pages have the extra space around them and are bigger in the album. I have two daughters and we collect their 8x10 school pictures in an album. We are running low on the sheets to protect them. needed more pages for 8 X 10s that would properly protect photos. I have many family pictures that I am putting in albums. It makes it much easier to show my children and grandchildren our family photos. I was looking to protect some old 8 x10 photos of my great grandparents I am hoping these will do the job - as it says in your ad . I bought 2 sets b/c I am looking for a way to keep all of my son's school pictures. I always purchase an 8x10 of him & of the class. So now, I can put them next to each other for him to keep. I love my exposure books and want to include my 8x10 wedding pictures into my family album. There were no more single weight photo pages, so I had to use these for my last Antico Leather Album. Have some larger photos to put in my book. They were the right specifications for the album I wanted to purchase, and the pages are acid free. Great protection for my photos. My favorite photo sleeves for my 8x10 photos from trips. Well made and archival quality. I am finally putting all my pictures that have been sitting in a drawer into photo albums! to fit with the other pages I already have in my Exposures album. Good quality. I'm doing a second album for my daughter and used this same product. Best deal around for the best photo products. Ordered a duplication of previous order. Fits school keepsakes like certificates, A+ papers, valentines, and more. I am an exhibitor of dogs. These are for my dog's win photos in her album. 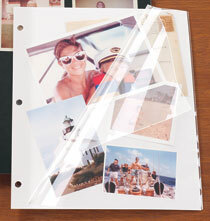 Works great for holding 8x10 pictures in a binder to commemorate past presidents for our non-profit. 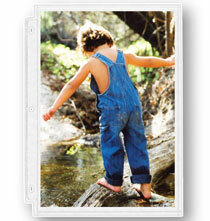 We purchased the binder photo albums from Exposures as well. past experience with exposures. Great, quality products. Very hard to find albums to hold 8 x 10 photos. I hope these will be the ones without the seam that was in some of them before! Prefer a basic 8x10, not an altered 11.5 sheet. Thank-you. All four items chosen for Presidential Albums I"m making for my kids. Great storage for school photos, recital programs, and other memorabilia. Make a kindergarten through college grad collection of all 8x10 photo album to include school pics and class pics (and grad pics). These pages are the best quality I have ever purchased. Excellent quality. I've been using these pages to store my children's portraits for 10 years. Your illustration confuses me. The dotted line looks like the page holds a larger print than 8x10. Does an 8x10 fit snugly in the sleeve or is there excess space left in the sleeve? BEST ANSWER: Thank you for your question. 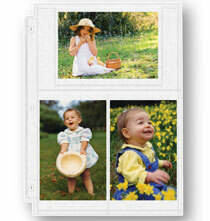 The Double Weight 8"x10" Photo Pocket Pages are 9 15/16"x11 1/4", so they do have extra space. We hope this information will be of help to you. will double weight 8x10 pages fit in the charter album? BEST ANSWER: Thank you for your question. Yes. the 3 ring album page will fit in the Charter classic 3 ring album or the extra capacity 3 ring Charter Album.We hope this information will be of help to you. Are they totally clear or is there a white background behind the picture? BEST ANSWER: They are totally clear. You can use them with 2 photos back to back. Why do they have side and bottom seams? BEST ANSWER: You insert the photos in the open top and the side and bottom seams prevent them from falling out of the pocket. It is a pocket, to cover and hold the entire photo. I want to give my 1966 black and white wedding 8x10 pictures a new album with photo slip-ins. Capacity of @ 50 photos. Do you have anything like that? Why did you stop offering the single weight pages? BEST ANSWER: Thank you for your question. Yes. Single weight pages are being discontinued. We apologize for any inconvenience. How do I erase one item in cart? It was clicked by mistake and now the order is double the number I want. BEST ANSWER: Thank you for your question. To remove an item from your shopping cart you must remove them at the shopping cart page. Please click the trash can icon in the last column to delete the line completely. If it is the quantity you want to change, change the quantity number in the box and click the update button.We hope this information will be of help to you.